IB Soft designs custom software for those specialized businesses that require powerful, hosted software solutions at a price that is affordable and cost effective. We are a company that is more like a good friend who’s looking out for your best interest. We aren’t out there to sell you something you don’t need. That’s why you won’t see long-term contracts to lock you in so you can’t escape. No, if the solution isn’t a solution then why would a friend force you to stay with it? We provide a free 30-day trial to see if our software is really a solution for you. There is no obligation and you won’t be charged until after the 30-days is up. After that, it’s monthly billing. OUR MISSION IS TO CREATE SOFTWARE SOLUTIONS FOR NICHE MARKETS, WHILE MAINTAINING EXCEPTIONAL CUSTOMER SERVICE. 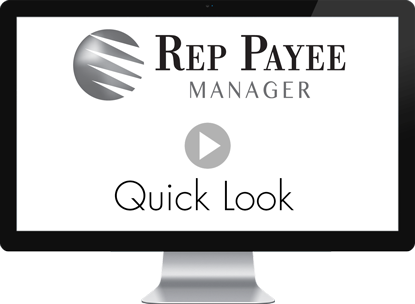 Our featured software is Rep Payee Manager. If you’re trying to manage payees with only QuickBooks™ then you are probably aware of the maxim “the right tool for the job.” QuickBooks™ is a great program for what it is designed to do, but managing payees is not within its job description. That is where RPM comes in. Sharing the load makes for a lighter load and RPM and QuickBooks™ working together takes the best of both and returns a superior product: payee management that is easy yet comprehensive. What do I mean by that? I mean a home page where in one place you can see all the SSI recipients who are over resources and by how much; upcoming bills or bills that are past-due; back payment status for each active back payment, the resolve date, the total and remaining balance; even birthday and other important alerts. Then, a payee dashboard that displays a complete account summary including their income, expenses and it auto calculates the payee paychecks for you; the check register, individual alerts, all the bills, notes, back payments and relationships. A growing list of reports to help you perform your job better and faster. For example: the payee income report printed out before you run the next month will include income and back payments being deposited on the 1st. That report will give you something to check off and confirm each deposit. There are reports for which payees are renting, where and how much they pay; who isn’t renting; who has back payments and their full status; a list of the vendors and their payees and the reverse; who is suspended and inactive; who is set to not have their paychecks printed and the other side of it, who has paychecks waiting to be printed and many more. Most reports are exportable to CSV/Excel format. RPM does the management and the transactions are exported out to an IIF file for QuickBooks™, where you print checks and reconcile accounts. Check out the video below to get a quick overview of how RPM works, then login to the demo to look around and try it out.